With all the changes to the news feeds, layouts & notifications on Facebook, I've found it's made it harder to interact. Not just with fans of my page, but with pages I'm a fan of too. This was the very thing I first loved about having a Sew Can Do Facebook page! I see my number of "Likes" growing daily, but feel sad how few will see new things thanks to these changes. Why is this happening? Well, unless you are consciously remembering to regularly visit & like/comment on pages you like, they fall off your Facebook feed into an unseen cavern because FB "thinks" they aren't of interest to you. Frequenty those get replaced with a bunch of sponsored (i.e. paid) updates. My own feed had 11 updates from a single page I never visit in just one day, but the dozens of pages I truly love and want to keep up with didn't even show up once all week. I later saw I missed out on some great news on many of them. Grrr! I've decided to add a new feature that I hope will help make it easier for Sew Can Do Facebook fans to keep seeing things AND gives you an opportunity to be seen as well. 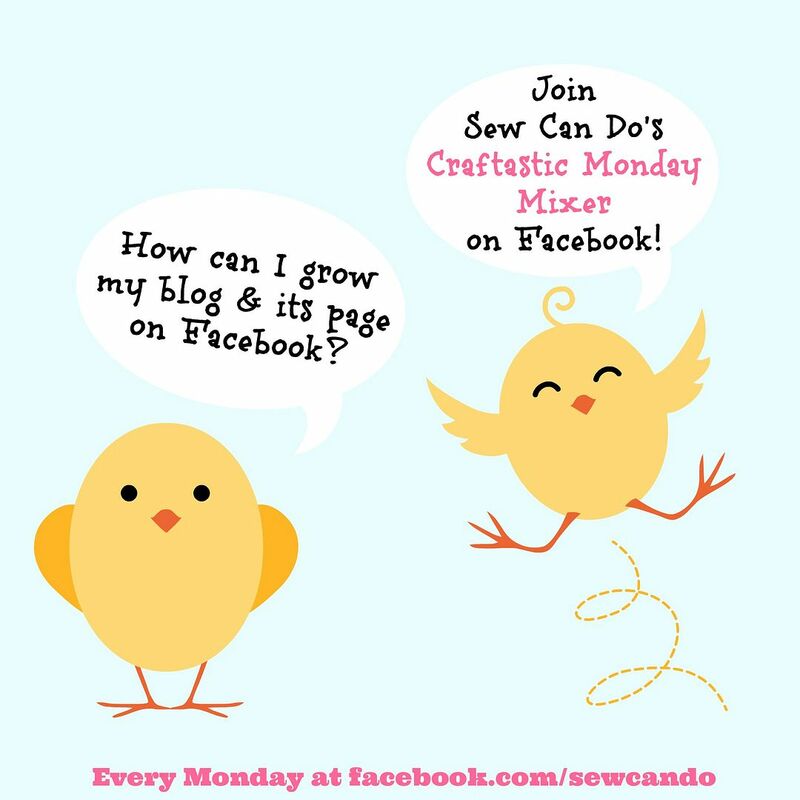 I'm calling it the Craftastic Monday Mixer on Facebook. Just like there's a Craftastic link party here every Monday, where you can link up your latest crafty blog posts, I'm going to launch a Craftastic Monday Mixer update each week on the Sew Can Do Facebook page. 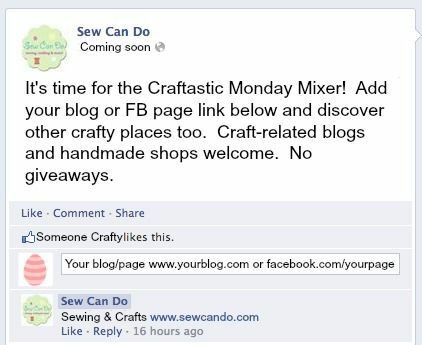 - Add your direct blog or Facebook page url in the comments of the Craftastic Monday Mixer update. If you want to add a word or two about your main theme (e.g. Sewing & Crafts) go ahead. - As long as your page or blog is mainly craft-related it is welcome. - Crafty, handmade shops will also be welcome. No giveaways though. - You can link up your blog/FB page every week. Be Seen & Find New Blog Love! I encourage checking out some of the fellow blogs & pages that link up, but I'm not requiring you HAVE to like/follow/comment them all. I'd love for you to like Sew Can Do on Facebook, but I'm not even going to require that. I really want this to be about finding creative places you like and having new, like-minded people finding yours. I'll be leaving it pretty open, but reserve the right to remove anything that I don't think is appropriate or seems spammy, so please use good judgement. Other than that, have fun, get noticed and find new crafty places to love! Hurray for CMM. I have only been on FB for a short while and still figuring it out. Then suddenly it got more confusing. Thanks for the help to us new bloggers. It's appreciated. I'll definitely be joining all you seasoned ladies.